Whether replacing a full-time income or picking up a side hustle to earn a little extra, cabi provides an opportunity for women to have an alternative career that is relevant, liberating, and profitable. What will you do as a cabi Stylist? Share a designer Collection of women’s clothing in pop-up shops hosted in our alternative store—the home. Become your clients' go-to fashion resource as you build relationships through personalized service and styling advice. Clients can shop easily anytime through your personal cabionline website and cabi's app, cabi Tap. Receive a 25% to 33% commission on items you sell. Think about how many shows you’d like to do a month. Envision your friends as Stylists and add them to your team. 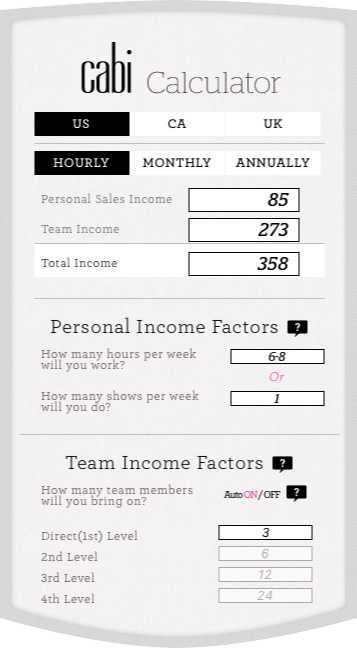 Play with the numbers and dream of what you can achieve with cabi! Receive additional commission based on what your team sells. Bring along friends and boost your income! * If you sell at least 2,500 in PQV per month (beyond a Stylist’s second season, this monthly sales requirement is 3,500 in PQV), you receive an additional 5% commission (an increase from 20% base commission to 25%) on every item you sell. ** If you and your first level team members collectively sell 24,000 in PQV in a month, you will receive an additional 8% (totaling 33%) commission on the items you sell. How you work your business is up to you! Here are two examples of women in different stages of their cabi businesses working the hours that make sense for them. * Based on a $1,500 show average and 10 selling months per year. * Based on a $1,800 show average and 10 selling months per year. Recoup expenses and earn additional income when you sell your Seasonal Inventory. Your initial investment for your Seasonal Inventory is either $1,000 (USD) or $2,500 (USD) plus shipping and applicable sales tax. At the end of every season, when you sell 70% of your Seasonal Inventory at 50% off, you could earn back your initial investment and more. With cabi, you’re in business for yourself, not by yourself. We’re here for you every step of the way. DISCOUNTED SEASONAL INVENTORY is yours, far below retail value. A SUBSTANTIAL CLOTHING DISCOUNT, which grows through sales over time and will have you always looking the part of a fashion Stylist. RECEIVE PERSONALIZED SUPPORT through a Home Office Team who is available and eager to help your business run smoothly. THE SCOOP is our seasonal launch event that reveals the new Collection through a stunningly beautiful fashion show and includes inspiration, collaboration, recognition, and education to fully equip you to be successful. While you arrange your travel and hotel, cabi covers all the rest as our investment in you! WE STAY ALONGSIDE YOU ALL SEASON through weekly training communications and opportunities to enable you to keep building a business for yourself that just gets better and better. 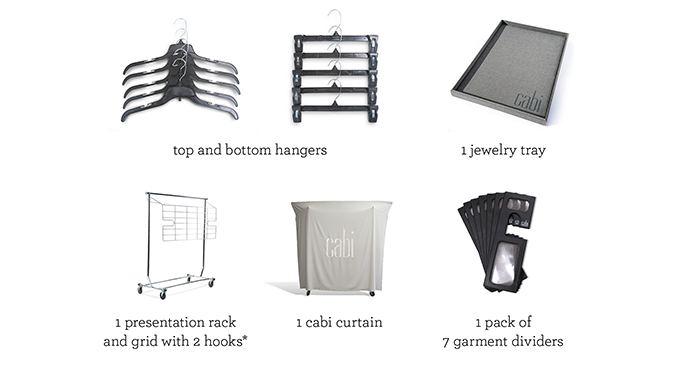 THE FREE STARTER KIT includes a cabi curtain, garment dividers, rack, order forms, Invitations and envelopes, and Invitation Inserts. 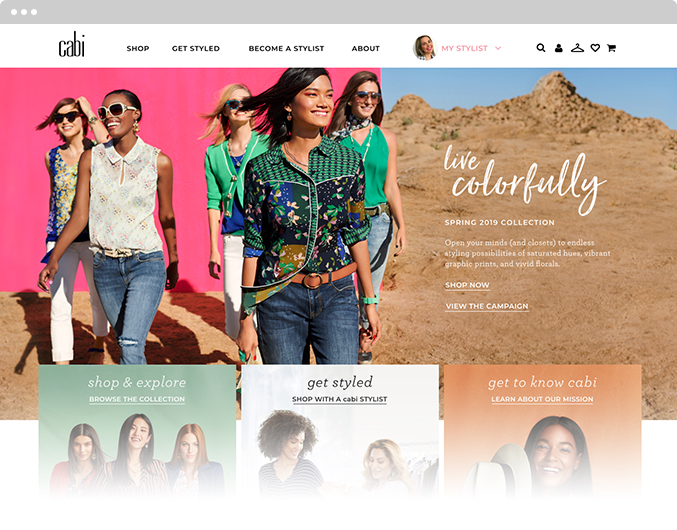 Cabi HOSTS YOUR VERY OWN WEBSITE featuring your name and photo. Updated every season, your clients can come here to see the Collection, learn about the latest styling tips, and discover more about the cabi career opportunity. GENEROUS DISCOUNTS for Hostesses further boost the appeal of having one’s very own Fashion Experience—season after season. 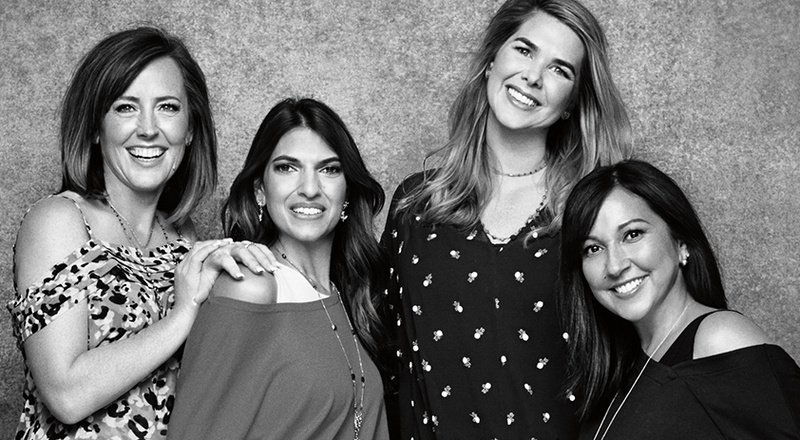 GROWTH OPPORTUNITIES abound as all cabi Stylists can become leaders and receive training to build their skills of communication, influence, and help others success. MANY REWARDS, AWARDS, AND PROGRAMS are provided to help you build the business you’re after, celebrating many milestones along the way with beautiful jewelry and Gift Cards to reinvest in your business. SPECIAL DISCOUNTS are offered to cabi Stylists to help them keep more money in their pockets, including discounts on office supplies, prescriptions, and cell phone service. 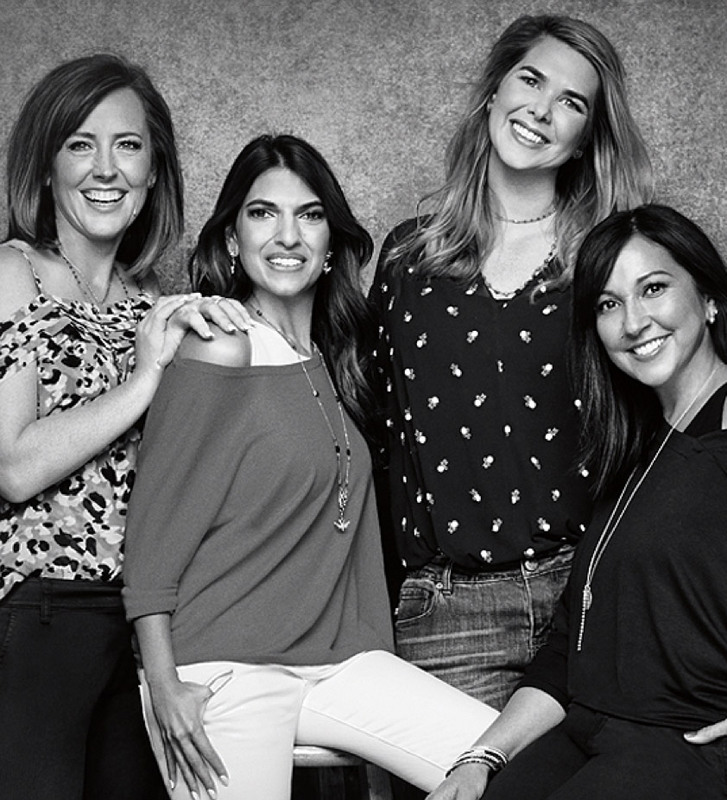 Cabi Stylists have diverse professional backgrounds, from young moms to Fortune 500 executives—no two stories are alike! 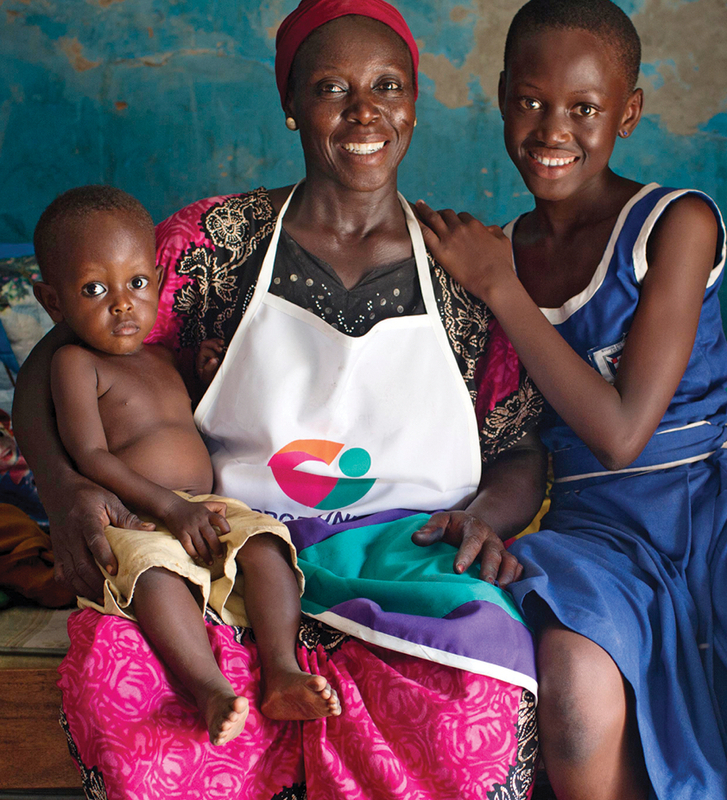 From day one, our Founders envisioned cabi offering a real career in which women could build a substantial business while putting first things first in their lives. As each cabi Stylist starts her business, we fund a small business loan for a woman entrepreneur in a developing country, making them “Sister Entrepreneurs,” growing their businesses together. Ready to learn more about becoming a Stylist? Join us at one of our next events.